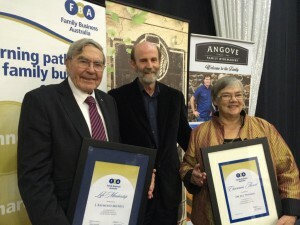 At the recent Family Business Australia (FBA) National Conference, two South Australians were formally recognised for their longstanding contributions to the Australian family business sector. Dr. Jill Thomas (right) was awarded the “Chairman’s Award in recognition for distinguished service to Family Business Australia” while Mr. Raymond Michell was awarded ‘Life Membership of FBA’. Dr. Jill Thomas (The University of Adelaide) is a pioneer of family business research and education in Australia. As one of the first in Australia to undertake a PhD on family businesses, Jill has co-founded the Family Business Education & Research Group (FBERG) at the University of Adelaide to advance family business scholarship in the Asia-Pacific region. Currently a director of FBA, Jill was a former director of the Family Firm Institute (FFI), the International peak body for family business educators, advisors and researchers, based in Boston, USA (2010-2012) and Vice-Chair (2012-2013). Mr. Raymond Michell AM, (former director of the merchant bank ‘Michell NBD Ltd’) formed Family Business Services S.A. Inc., which later became the S.A. Chapter of Family Business Australia. In 2004 he was awarded an ‘AM’, for service to the business sector, particularly furthering recognition and understanding of the Australian family business sector. This entry was posted in Connect, Family Business, Research and tagged Adelaide Business School, Adelaide MBA, family business, Family Business Australia, family business education and research group. Bookmark the permalink.